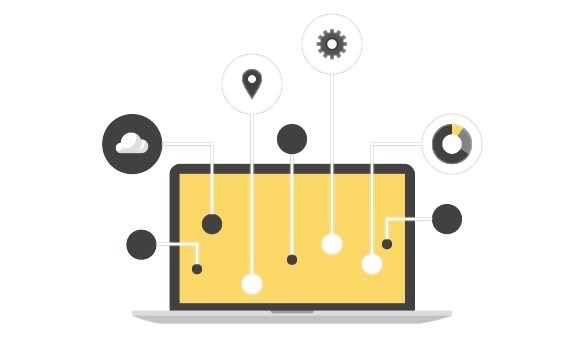 Whenever you connect to the 4everproxy network, we produce an exclusive 2-hour session, which provides anonymous browsing. All content you visit through our service is translated only and can not be viewed by anyone. All user login sessions are removed every 2 hours for security reasons and for server performance. 4everproxy is also well suited for video sites such as YouTube. Our service also allows users to access YouTube video quality control. Thanks to 4everproxy, you can unlock anything! Enjoy and have fun with unlimited surfing! 4everproxy is a free proxy that mediates between your computer and the Internet. It is also a web proxy and an anonymous proxy. It is a web proxy that focuses on facilitating your access to the World Wide Web. It acts as an anonymous proxy, which attempts to make all online activities untraceable. It hides your personal information so you can browse the web anonymously and access restricted sites in your network or region. 4everproxy provides you with a free proxy, web proxy that helps you browse the internet anonymously. We hide your IP address, protect your identity online, secure your Internet connection, allow access to blocked sites, unblock YouTube, unblock Facebook, unblock Twitter, etc. We also ensure that all content you browse through this service is encrypted individually and can not be seen by anyone. Users can rest assured that all their credentials are anonymous and can not be accessed by anyone because all sessions are erased and erased every two hours. Although the main purpose of 4everproxy is to allow users to access restricted websites with free proxy, anonymous web proxy, and to unlock social media sites like YouTube, there are many benefits to using this service . .
• Easy to use. Users can easily access restricted websites through 4everproxy. All you need is a click of the mouse. Since the service is designed for easy access, users should simply copy the link to the text field above and click on the “Go to Site” button. Users will just have to wait a few seconds and they can start browsing. • Minimize risks. Since 4everproxy allows users to browse the Internet anonymously, it minimizes the risk of identity theft. It also protects personal data and user information, since the service deletes all browsing history after 2 hours. Whether you’re just browsing your Facebook page or shopping online, this service can prevent your identity from being seen by anyone. For 4everproxy, the anonymity and confidentiality of the users are its main concern. • Provide free access. Some websites are not accessible to other countries. Some websites in the United States are not accessible to other regions such as Asia. By using our free anonymous proxy and our web browser, web browsers in other regions can access geographically restricted websites for free. • Access and receive useful and objective information. There are news sites such as CNN that recommend news articles, news and videos, depending on the region or geographic location of the users. This is also the case with YouTube, where it only approves videos on the market, based on their location and region. This restricts users’ access to certain valuable information. Thanks to 4everproxy, those who want to collect information beyond their current location can access these restricted sites. It’s perfect for researchers, journalists and writers, who want to learn more and explore other topics outside their comfort zones. This page is one of the perfect sites that one can see if you’d like to access other hosts indirectly. Through the proxy servers that can be found in this site, you are able to bypass any web filters integrated on the computer. You can use the proxy servers when you’re at home, at the office or at school to be able to access those sites that you are unable to access using your normal connection. There are in fact many sites that are restricted from access, which depends on your location or what device you’re using on. For example, when you are at the office, you’re oftentimes restricted from accessing social media networks such as Instagram, Facebook, and so on. Through this proxy server website, you can easily bypass these limitations and savor an even better web browsing experience. 4everproxy is a free and secure web proxy. Change your IP address and remain anonymous while browsing the Internet. 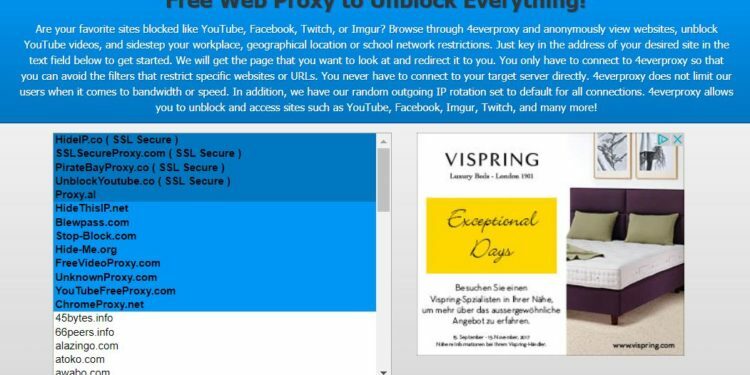 Unblock websites with 4everproxy! Besides gaining access to websites that are normally limited on your system, this website will even allow you to make the online browsing activities confidential. Through this website, you can really keep your browsing habits out from the prying eyes of anyone. You could go around any internet site without having any person knows your identity. This great site is also helpful if you are researching information that you wouldn’t like others to learn about. If you don’t want to skimp on your name, then this site has everything you need. Needless to say, this web site should be only intended for lawful activities. You cannot use this site if you are planning to perform things which break the law. One more highlight that one can enjoy with this website is you are able to use its proxy servers to ensure a safe and secure connection to a different web server. You can access websites without having to worry about viruses and the likes. The proxy servers in the website will even make it easier to filter any encrypted data that you may possibly get through the system. Files can be routed from different host to yours without any difficulty by making use of this site’s features. With this hassle-free website, it’s really a given for one to get the finest surfing experience. Regardless of the type of internet site you’re planning to access, the proxy servers available here in this web site will offer you unhindered connection. Certainly, it’s through this web site that one can surf online secretly. With this phenomenal website, viewing is much safer and better for everybody! This website is just one of the best sites that one can visit should you want to access other hosts indirectly. Through the proxy servers that are available in this amazing site, you’re able to bypass any kind of web filters integrated on your PC. You can utilize the proxy servers when you’re at home, at your workplace or at school in order to access those internet sites that you’re unable to access with your normal connection. There are in fact many sites that are blocked from access, which depends on what your location is or what device you’re making use of. One example is, when you are at work, you are oftentimes restricted from accessing social media networks like Instagram, Facebook, and the likes. With this proxy server website, you can bypass these limitations and savor an even better online viewing experience. Not only justunblockit helps you access blocked sites, it also helps to surf the Internet secretly (anonymously). Justunblockit is very user friendly. It redirects your network traffic through their servers so that you can access these sites in light of the fact that their servers are not blocked to access this site.